Family and friends helped trainer-driver Roger Mayotte celebrate both a Gold Series victory with two-year-old trotting gelding Okeanos and his 62nd birthday at Woodbine Mohawk Park on Thursday, August 9. 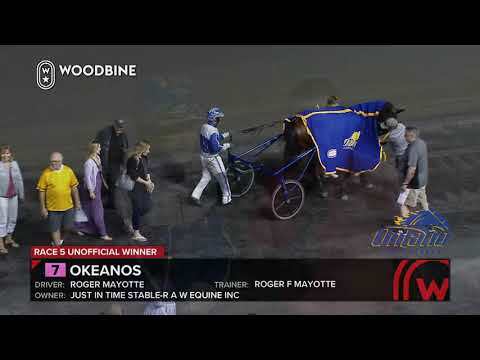 AUGUST 9, 2018 - Roger Mayotte has been expecting big things from Okeanos since the harness racing gelding arrived in his barn last October and on Thursday night the two-year-old trotter put all the pieces together and gave the Mississauga resident a trip to the Gold Series winner's circle for his birthday. "I was hoping," said Mayotte with a chuckle. "I was hoping. "He's very, very nervous, a high strung horse. He's been an ongoing project that way through the winter," the 62-year-old continued. "We had to get him over that stuff, but he's always showed us some speed and the gait." Okeanos showed off both his gait and speed in Thursday's victory at Woodbine Mohawk Park. Starting from Post 7 in the second $67,200 Gold division, Mayotte settled the gelding in seventh as Lifetime Royalty stormed out to a :27.4 opening quarter. The pair joined the parade up the outer lane heading for the :57.2 half and by the 1:26.3 three-quarters they were three-wide and Mayotte was reaching for another gear. Okeanos responded with a burst that saw him reel in the leaders and claim a one-half length victory in 1:56.4. Southwind Avenger also closed hard to claim second and fan favourite Dream Nation was third. The win was Okeanos' first, coming on the heels of a break in the July 16 Gold Series season opener and a hard-closing second in the July 31 Grassroots leg, both at Woodbine Mohawk Park. "He's been showing a lot of promise all along and when he broke in that first Gold there, in my mind he was going to be first or second, the way he was starting to change gears. Unfortunately I think it was my fault, I might have just startled him a bit," reflected trainer-driver Mayotte, who also shares ownership of the gelding with his partners in the Just In Time Stable of Mississauga and R A W Equine of Burlington, Ontario. "We decided to go to the Grassroots instead of going to Georgian to keep him on the big track; he's a fairly big colt." Mayotte noted that the long-legged son of E L Titan will also miss the Sept. 24 Gold Leg over Grand River Raceway's half-mile, but is eligible to the Aug. 31 Champlain Stakes and the Sept. 8 William Wellwood Memorial eliminations at Woodbine Mohawk Park. So long as he remains happy and healthy Okeanos will return to the Gold Series for the Oct. 4 event at Woodbine Mohawk Park, hoping to score another top finish and tally enough points to land one of 10 berths in the season ending Super Final. Through his first two Gold starts the gelding, a $62,000 purchase from the London Selected Yearling Sale, has accumulated 51 points. Forbidden Trade padded his point total with a 1:57.4 victory in the first Gold division, besting Cool Clifford by one and three-quarter lengths. Isnt He An Angel was seven lengths back in third. Bob McClure piloted the heavy favourite to his second Gold Series win for trainer Luc Blais and owner Determination of Montreal, Quebec. The Kadabra colt also triumphed in the July 16 season opener. "He's been a complete professional right from the start, he acts like an aged horse," said McClure, who felt the colt may have been at his most impressive in the July 29 Gold Leg at Georgian Downs, where he finished fourth. "Last week was probably his most impressive mile, he was just beat a head for second. Three of the previous week's winners were in together and he had the nine-hole and got away last," the Elora resident told Woodbine Mohawk Park's Chad Rozema in the winner's circle. "I think he showed he's one of the best, if not the best colt in the division right now." A $110,000 purchase out of the Harrisburg Yearling Sale, Forbidden Trade has accumulated 108 points and $65,076 in his first three starts. The final division saw Royal Rob make a successful transition from the Grassroots to the Gold, scoring a second straight victory in 1:56.3. Knight Angel was two and one-quarter lengths behind the fan favourite in second and pacesetter CT Conabra was third. "He's a nice colt. He's smart and has a great gait," said driver Trevor Henry, who also piloted Royal Rob to a Grassroots victory at Woodbine Mohawk Park on July 31. "He has all the tools to be a good one." Hall of Fame horseman Bob McIntosh of Windsor bred Royal Rob and shares ownership of the Royalty For Life son with Dave Boyle of Bowmanville, Ontario, Gordon Wright of Charlotte and Randy Liepa of Livonia, Michigan. Thursday's victory gives the trotter 50 points toward a Super Final berth with two regular season events remaining. On Friday evening Woodbine Mohawk Park will showcase the two-year-old trotting fillies in a pair of Gold Series divisions, scheduled as Races 5 and 9 on the 7:30 pm program.